What is it? Zotero is a bibliography manager that enables you to keep track of everything you read and cite it correctly with very little effort. It captures information from library catalogs, databases, and websites so that you don’t have to write it down. You can use it to not only gather bibliographic information from these sources but also to save and organize documents and files of any kind. Zotero works with your browser (Firefox, Chrome, or Safari) and your word processor (Word, OpenOffice) on both Windows and Mac operating systems. Zotero is easy to learn and even easier to use. 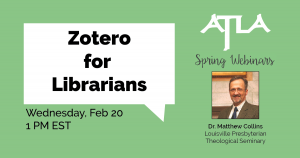 This webinar will introduce you to Zotero and how to use it for bibliographic management. You will learn how to use Zotero to add citations and a bibliography to a document, including how to set style preferences and change them as needed. You will also learn how to organize your personal library with both folders and tags. To prepare for the webinar, please go to http://www.zotero.org and download the version appropriate to your system. You will also need to download the browser plugin for the browser you intend to use. This webinar will be led by Dr. Matthew Collins, Director of the Ernest Miller White Library and Professor of Research and Bibliography at Louisville Presbyterian Theological Seminary.